Learn, play, create and change the world around you with just a touch, swipe or jot on the iPad 2018. From viewing photos, browsing the web or watching videos, you’ll see it all in unbelievable clarity with the multi-touch 9.7” retina display and 2048 × 1536 resolution. 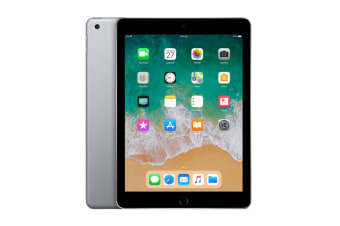 With a 64-bit A10 fusion chip, the Apple iPad 2018 offers performance that is more fluid and faster than ever before. Editing a 4K video and graphic-intense games are no problem, and with a 10-hour battery life you can enjoy hours of entertainment. Draw, write, highlight, copy, paste, paint or mark-up an email – with the versatile Apple Pencil it’s all possible. Shaped like a classic pencil, this smart accessory lets you write and draw as naturally as you would on paper thanks to the built in pressure sensitivity (harder for thicker lines, tilted for shading), so you can easily annotate or edit in the apps you use everyday, anywhere, any time. Take the virtual into reality with the iPad 2018’s Augmented Reality (AR) compatibility. From the display, cameras, motion sensors, apps and processing power, fun isn’t limited to the screen. Learn, play and change the world around you with iPad 2018’s AR. The 8MP rear camera allows you to take detailed photos or film in brilliant 1080p HD videos. Also, with Photos, iMovie or another app from the App Store, you can instantly edit them on your iPad 2018.